Rated 1 out of 5 by disappointedcustomer from Do Not Buy I purchased this pump new in an emergency situation. The recoil broke internally on the third pull, I never started the unit. I contacted support and they will not send me a replacement recoil even though I sent them the pictures of the broken internals and my receipt dated the same day I contacted them along with photos of the serial number on the unit and the box I had just unpacked it from. They need me to take it to a service center, have it inspected, and a claim filed. Very poor quality which the company does not stand behind. Usually I spend more on a quality product but I was in a pinch due to flooding. You get what you pay for. Rated 1 out of 5 by Frank from Lasted for about 3 tanks of fuel. Bought this pump last summer for this year's maple season. On about the third tank of gas the plastic cam gear broke. After looking about everywhere part is unavailable and doesn't even list a part number. Rated 5 out of 5 by Aj99 from Lot of pumping power Bought new locally. Use it to pump water from totes to other totes. Use it to pump liquid fertilizer to tank on tractor. Use it dewater my basement. Water trees and the garden. Had it for 4 years, thousand of gallon pumped. No problems. Great starting, easy priming, light weight. Good job. Rated 5 out of 5 by Sweet1 from See Below A portable lightweight “sweet” pump. Used to transport maple sap up a hill to a miracle process of “generacing” maple syrup. A pump as dependable as Spring Nature in the North America. Rated 5 out of 5 by Cedarsavage from Stout little pump This 1" pump is an over achiever. I bought it to drain my pool and it was perfect for my application, easy to start, good on fuel consumption, and discharged at a very satisfactory rate! Rated 1 out of 5 by Hans from Poor service I used the pump for about 3-4 hours, and a seal went bad between the engine and pump mechanism. I've looked all over for parts availability and there are no sources for parts, not even a parts list that I can find. I guess I'll tear it apart anyway and hope that the seal relatively standard and available through another source. If not, the pump is worthless, and what I could very easily fix myself for a nominal cost may as well be thrown into the trash. I do not recommend this product. Rated 4 out of 5 by DW from Good pump Just purchased the CW 10k and used today. The pump was easy to get started out of the box and everything was supplied to get running, obviously without fuel. Pump started and ran without any problems. Shortly after starting I noticed a small leak in the fuel tank at the fuel tank connecting bolts at the rear of the engine. I called the service center and they were very attentive and referred me to a authorized repair agent. Not what I wanted to hear. I don’t want anyone to work on my equipment or verify there is a problem. I can do that and prefer to do that myself. 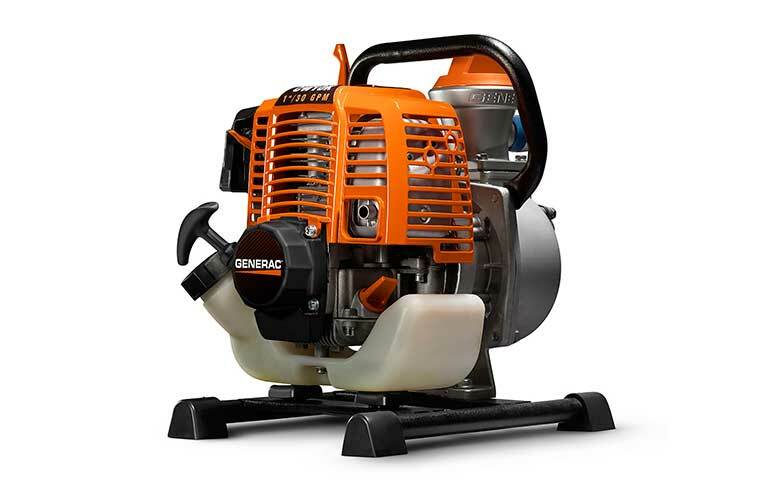 I have purchased many other outdoor power equipment items had very few problems but when I did have a problem the other manufactures instantly provided me with replacement parts. Not likely I’ll purchase a Generac product again. Rated 3 out of 5 by Mike from Recoil failure I’ve had 2of these. First unit recoiler broke within first six pulls. 2nd unit lasted about 50 tank fill ups and then same recoil failure. The plastic part breaks. This one I’ll contact C’s and see if Part is available. CW10K-6917 is rated 3.2 out of 5 by 19.